This is the last of a 3-part series on advanced conditionals in English. Click here for part 1 (mixed conditionals). Click here for part 2 (inverted conditionals). You may have noticed that I’m a big fan of humour and being funny. I mean — who doesn’t like laughing? But there’s another reason I crack jokes all the time. And it’s also the reason I want you to start trying to be funny in English. Well, a lot of jokes work by playing around with the language. When you play around with a language, you’re becoming a master of it. And you wanna be an English Master, right? A hilarious English Master. You can find humour in language in lots of different ways — through pronunciation, through grammar, through phrases and wordplay. 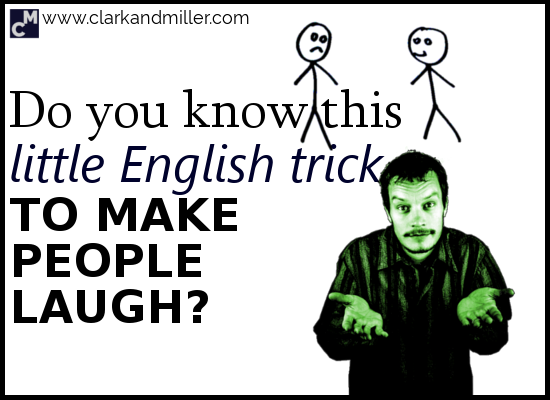 Today, I want to share with you one of my favourite little tricks in English. It’s not always used to be funny, but in some situations, it can really make people laugh. Remember that timing is everything! Why do we use those hypothetical conditionals (the second and third conditionals)? These conditionals are all about what’s NOT real. We’re dreaming — imagining a world that doesn’t exist. So sometimes, it’s kind of fun to bring the whole sentence crashing back down to earth again — forcing the conversation back to reality. If Batman was here, he’d save us! But he isn’t here, so he won’t save us. If Batman was here, he’d save us. But he isn’t, so he won’t. What’s that? You want more examples? OK, then. If I liked horror films, I’d totally come and watch IT with you. I don’t like horror films. I won’t come and watch IT with you. If I liked horror films, I’d totally come and watch IT with you. But I don’t, so I won’t. If I’d listened to you, I would’ve won all the cakes. I didn’t listen to you. I didn’t win all the cakes. But I didn’t, so I didn’t. If I’d listened to you, I would’ve won all the cakes. But I didn’t, so I didn’t. If I hadn’t taken this job, I would regret it. I took this job. I don’t regret it. But I did, so I don’t. If I hadn’t taken this job, I would regret it. But I did, so I don’t. This feature of English is also very useful if you want to turn down (reject) an invitation. Maybe Eric wants you to come to his house and check out his stamp collection. This is a post about humour, so I feel I should write something funny here. But what? Have you got any ideas? One thing to remember: this doesn’t work with inverted conditionals. It just sounds weird! But it’s also useful because it can bring the focus back to a conversation — creating unreal situations can be interesting, but it’s not always the most constructive thing. An added advantage of this trick is that you really practice controlling those auxiliary verbs! Need some practice? Try bringing these sentences back down to earth for me. Answer in the comments! If I could fly, I would catch drones. If I’d studied science at uni, I’d be earning a lot of money by now. If the neighbours didn’t listen to metal all the time, I might be less stressed. If you understood me, you wouldn’t be making that face. Did you find this useful? Do you know any people (or cats) that might also benefit from this? Then BE AWESOME AND SHARE! Spread the knowledge! ⟵Inverted Conditionals: Have You Mastered This Advanced English Trick? Says Sheldon Cooper in The Skank Reflex Analysis, and It’s one of my favourite jests. Perfect example of it working in “real” English to provide humour! If I could fly, I would catch drones. But I can’t, so I won’t. If I’d studied science at uni, I’d be earning a lot of money by now. But I didn’t, so I won’t. If the neighbours didn’t listen to metal all the time, I might be less stressed. But they do, so I won’t. If you understood me, you wouldn’t be making that face. But you don’t and you will. But be careful about the second clause. Remember that “would” isn’t referring to the future, but either a general time or the present. This is the same for your other answers, too. I was wondering if the 2nd should be “but I didn’t so I’m not.” Please correct me. The series has been very helpful. Thanks! Yes! That’s exactly right. Good work. How were the other ones?